Almost three months have passed since Typhoon Haiyan struck the Philippines on November 8. According to the National Disaster Risk Reduction Management Council (NDRRMC), over 16 million people have been affected, and more than 6,200 deaths are now attributed to the super typhoon. The number of displaced persons is still high, but families are returning to damaged homes and attempting to rebuild their lives. More than 1.1 million homes are damaged or destroyed. Rains plagued the Visayas in early January, adding to the discomfort of families already left homeless by typhoon Haiyan, and hampering mobility of government and nongovernment staff and aid workers. These rains also reduced attendance at some Child-Centred Spaces (CCS), as parents did not let their children go out in the rain. ChildFund continues to provide for families and children affected by the super typhoon an integrated response addressing their well-being, development and protection needs during the relief and early recovery stages. 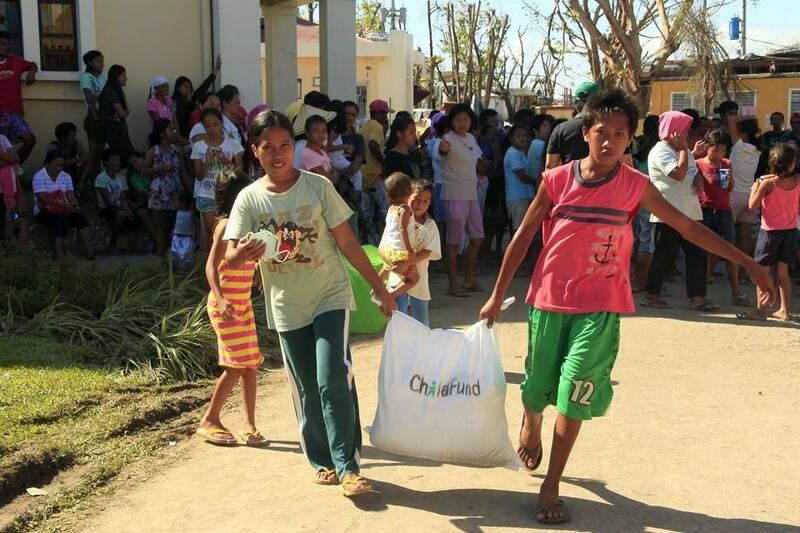 ChildFund continues to send food and non-food aid to Palo and Tolosa towns, which were flattened by typhoon Haiyan. Child-Centered Spaces also assist children at these sites. Child-Centred Spaces (CCS) operations continue at the 3 sites. Most public elementary schools and Day Care Centres resumed on January 6. This has meant reduced CCS schedules since the majority of children ages 3 and higher are pupils or day care children. The three CCSs are conducted only on Saturdays and Sunday. 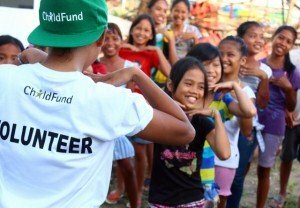 ChildFund is working with community-based child protection mechanisms, Local Government Units, the Department of Social Welfare and Development (DSWD) and schools to ensure children continue to be protected, and CCS activities will integrate into community based or school-based approaches. Most public elementary schools and Day Care Centres resumed by January 6. This meant reduced CCS schedules since the majority of children ages 3 and higher are pupils or day care children. Therefore, the three CCSs are now conducted only on Saturdays. Staff and volunteers hosted an informal meeting with parents whose children are attending CCS activities, to allow them to share their observations of their children’s behaviour at home, after having attended CCS. Parents shared their satisfaction for seeing their children happy at CCSs. In addition, ChildFund provided school teachers in barangay Naungan and Linao with training on psychosocial support, and with ChildFund’s psychosocial support training modules that provide detailed activities to strengthen children’s social and emotional skills and well-being. Bi-weekly reflection sessions with CCS facilitators (volunteers trained by ChildFund) are part of ChildFund’s effort to improve the quality of CCS activities and to support facilitators in their professional development. CCS activities continue to operate through local volunteers and schoolteachers. While classes at most schools have resumed, school teachers still conduct psychosocial sessions after their classes. Most of the current CCS sites will be transitioning into a community-based child protection model by end of February or mid-March 2014. To that effect, a transition strategy guide on CCS, together with important templates and resources, has been developed, as it will serve as a guide to the field teams on how to phase out or transition CCS activities in a contextually appropriate manner. The assessment has been completed in all areas covered by ChildFund emergency response. In total, 32,575 food and 9,771 non-food items have been delivered so far, and 13 CCS sites were setup. Tolosa in Leyte was flattened by typhoon Haiyan. ChildFund is invested in relief aid and psychosocial support for children. ChildFund continues to discuss details of a proposed child protection and education project with UNICEF. Both organisations are committed to enter into a Partnership Cooperation Agreement (PCA) and if all goes well, the PCA will be signed by the next report. UNICEF’s signed Nutrition PCA has started mid-December and efforts are underway to coordinate target municipalities, recruitment of staff and realignment of budget. ChildFund Alliance partners and ChildFund International continue to raise important funds for the Super Typhoon Haiyan (Yolanda) emergency and recovery. In addition, 240 LifeStraw filters arrived in Cebu in January and ChildFund will use these in schools and CCS within the targeted RISE municipalities.